The COPD Foundation’s Pulmonary Education Program (PEP) is proud to offer Harmonicas 4 Health (H4H), the first nationwide harmonica program created especially for individuals with COPD and other chronic lung diseases. This program was developed and launched due to the generous support of ACM Lifting Lives, the charitable arm of the Academy of Country Music. Duff Maynard, 66 years old, can attest to the benefits of H4H. Originally from New York, Duff moved to Tennessee, a state with the highest rates of COPD in the country, 11 years ago. He is a former smoker and also lives with asbestosis. Duff first learned he had COPD about 10 years ago and has been using a variety of medications ever since. 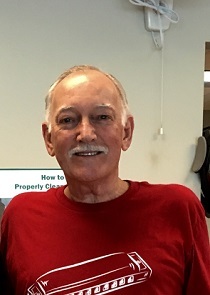 He has been through pulmonary rehab for a year and a half ago and is an active member of the Better Breathers Club in Murfreesboro, TN. Duff’s life after his diagnosis didn’t change much initially, until 3 years ago when he experienced his first exacerbation. Then everything changed. Then in early 2016, during one of the Better Breathing Club meetings, H4H was presented by Stephanie Williams of the COPD Foundation who asked for volunteers for the pilot program. Duff immediately joined as did many in his club. “I’ve never played the harmonica before. I always wanted to play a musical instrument and this was a chance to do it. My wife joined also which is great because we get to practice together and support one another,” he said. Duff has seen the positive impact of the H4H program ever since. He knows the story will continue, but shared several impressive milestones that he has reached since joining H4H. Before the program, Duff struggled to exercise and really had to push himself to get to the gym. Now he can’t wait. He could only do 30 minutes on the treadmill at 2.0 mph. Recently, he hit 60 minutes at 2.2, and now he can make it to 60 minutes at 2.5 mph. Before H4H, he could barely make 30 minutes of weight training. Now he can do 60 minutes with more weight. He works out on the treadmill 3 days a week and weights the other three, taking Sunday off. You do not have to be an expert player or have any musical experience to benefit from playing the harmonica. You can take a harmonica anywhere. It’s lightweight and easy to carry. Making music with a harmonica can help you feel better overall, and it is a lot of fun! Learn more about the Harmonicas 4 Health program here! I'm here to encourage anyone with COPD, or other breathing problems to find out about the wonderful health benefits of Harmonica use. Ten years ago I was in a very bad traffic accident, and in rough shape considering my already existing COPD. After being in Intensive Care for 8 days I needed to try to get back in shape to maintain what breathing function I'd had. The Pulmonary/Cardiac program at out our local hospital had a volunteer come to their Pulmonary Rehab group to pass out harmonicas, and teach us the mechanics. He was a musician, but had health problems that led to a heart transplant. His lungs were not great either. He was an inspiration when he describes how he diligently used his harmonica to improve his cardio-pulmonary function beginning with his transplant hospital stay. He's been active, and back to an active life now, but says the harmonica was a big part of his recovery. We had good fun learning to play as a group. This wonderful man also entertained us with his guitar, and harmonica skills. H is very talented. I'm going to get the kit offered on here. This sounds great. How do you find a group in your area? I did pulmonary rehab last summer, it was so helpful. Would love to try this. I have no musical talent. But I'll try anything to help myself.